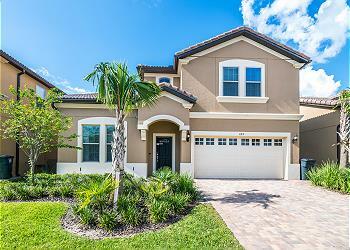 This home is only one block from the fantastic community resort pool and clubhouse. 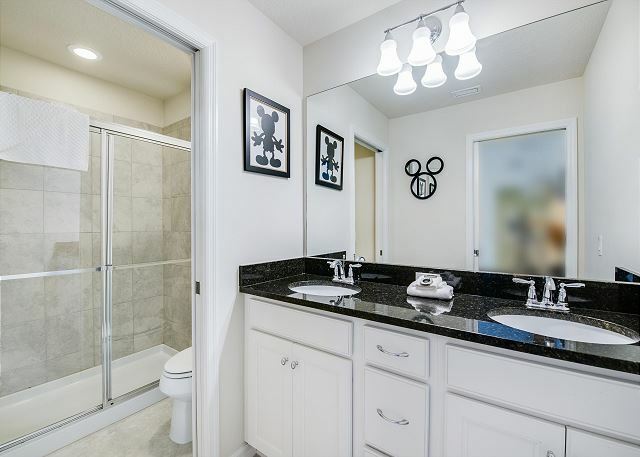 This prime location offers convenience to your family where you are one of the closest properties to these world class amenities. With 4,034 sq. 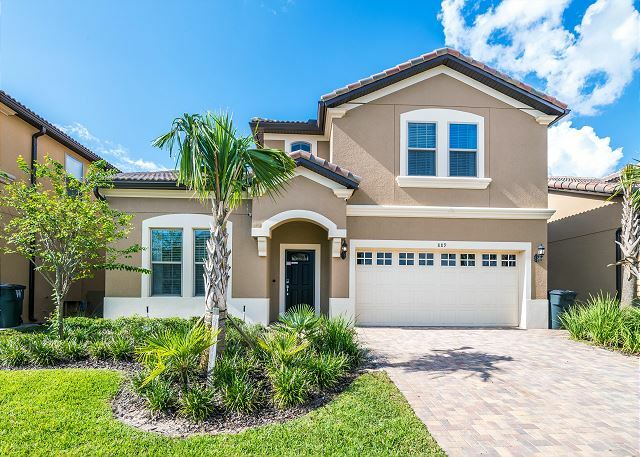 ft of space, this home has a large 26 x 12 ft pool and spill over spa-perfect for the kids who will enjoy their daily swim. 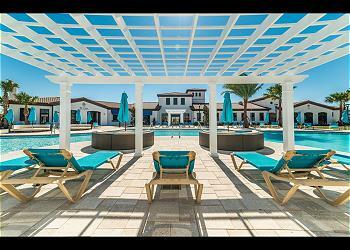 Sit back and relax in the Florida sun on your private lanai. 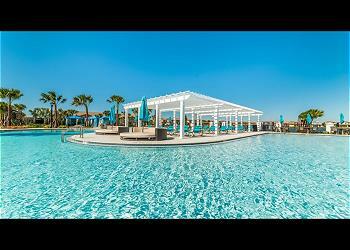 You could not ask for a better resort for you and your family. 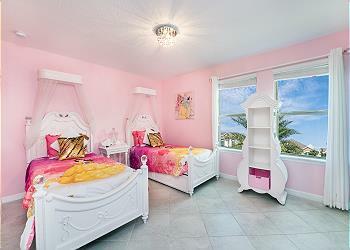 This 8 bedroom, 6 bath luxury villa sleeps 19. With a master suite on the first floor complete with King size bed and large, 55" 4K LED TV. Also, downstairs is a Queen bedroom with 32” LED TV, with an adjoining bathroom that has a walk-in shower. 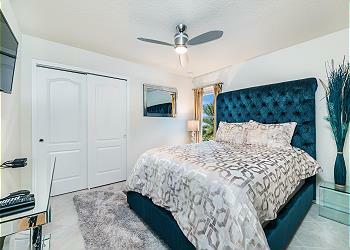 Upstairs, the second floor has another master suite with King bed and a further five additional bedrooms all with LED TV`s. 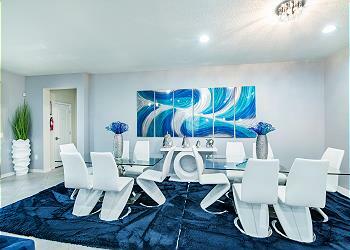 With an open layout in the living room, dining area and kitchen, the family can enjoy quality time together. 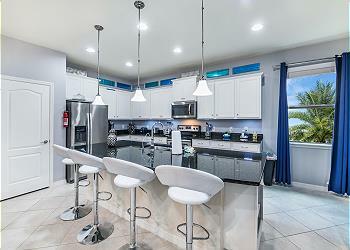 The kitchen has all stainless steel appliances and granite counter-tops. 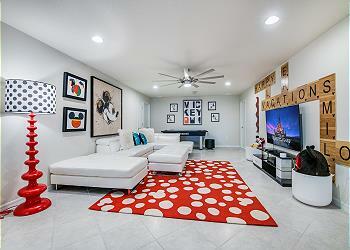 The living room has ample seating surrounding the huge, 65” 4K UHD LED TV with HD DVR for all cable channels. 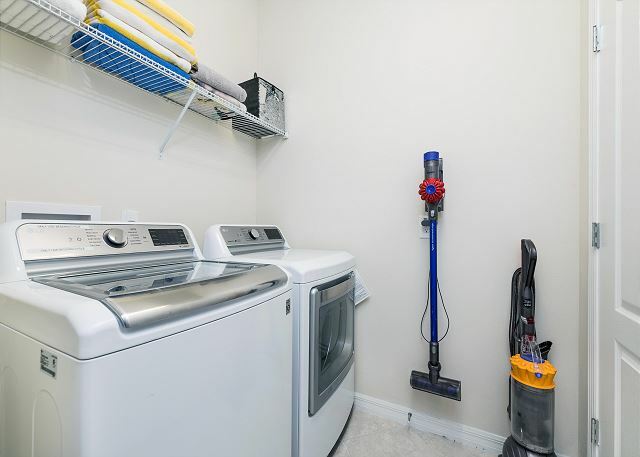 The laundry room is also located downstairs, so you won't have to worry about running out of clothes during your family vacation. 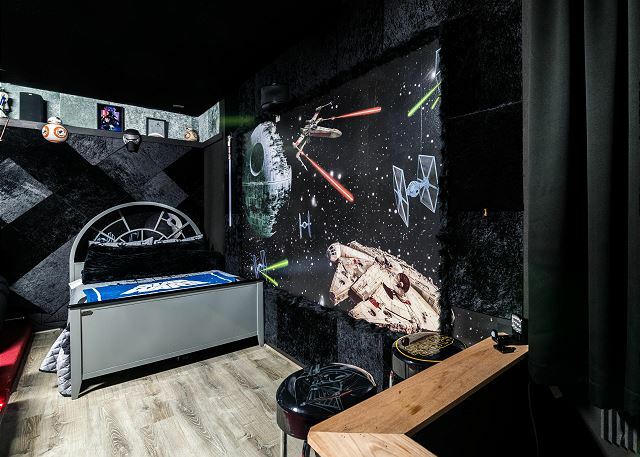 After a long day at the park, kick back in the STAR WARS THEMED THEATER ROOM and enjoy some popcorn and watch a movie on a huge, 80” 4K UHD LED TV. Then, Just lay back in our BROOKSTONE MASSAGE CHAIR for a relaxing body massage. 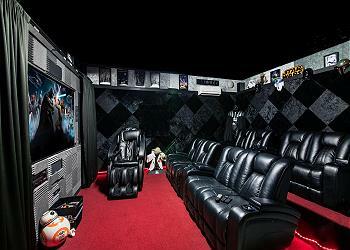 There is even a double bed for two people in the movie room for extra space. 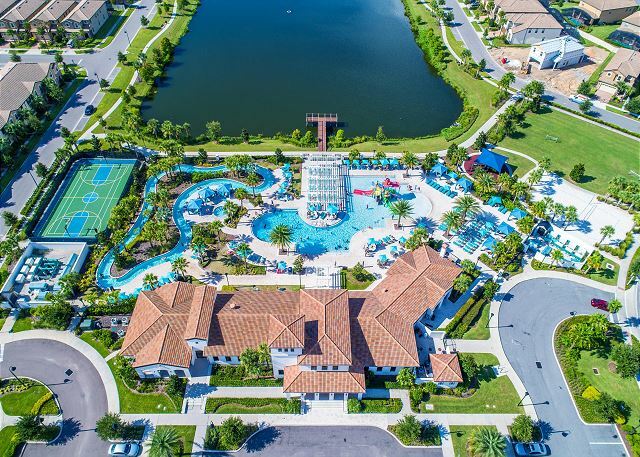 With all of this and more, this home provides everything you need to relax and enjoy your Florida vacation in style. General: • 4,034 sq. 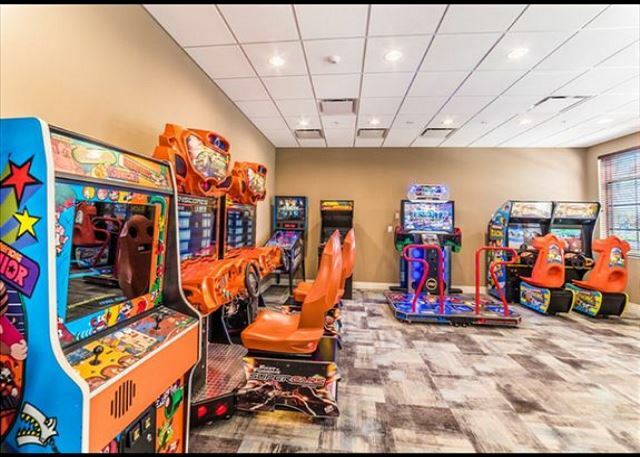 ft of luxury accommodation • Dining area • Second floor den area with game room • Bath Towels and bed linens are provided • Complimentary high speed wireless internet. 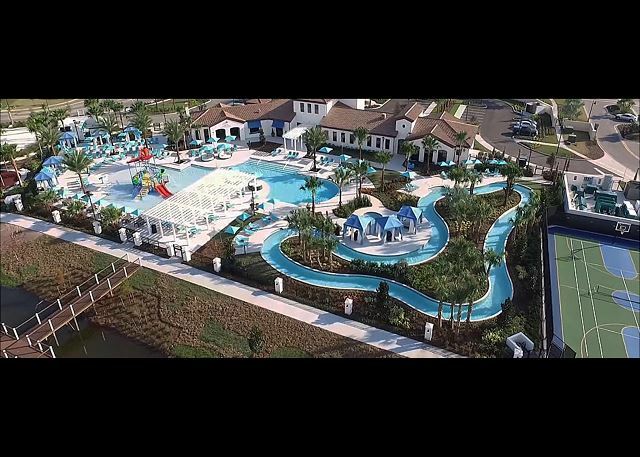 Pool Area: • Private pool and spillover spa • Patio furniture • Child safety fence around pool area. 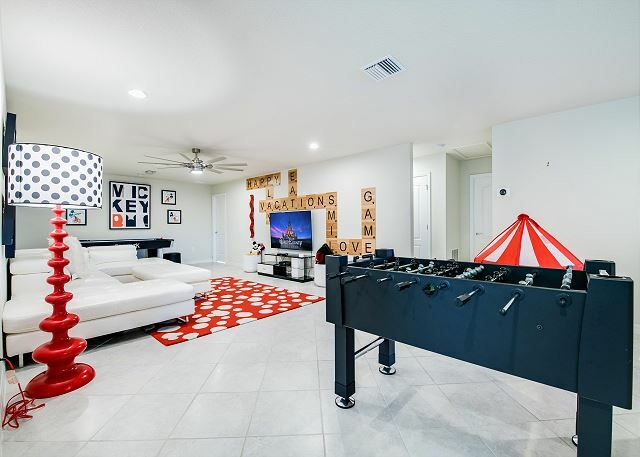 Upstairs Den: • Large, 65" LED 4K UHD TV • Air Hockey Table • Card Game Table • Foosball Table. Living Area: • Giant Flat Screen TV • Large Sofa. 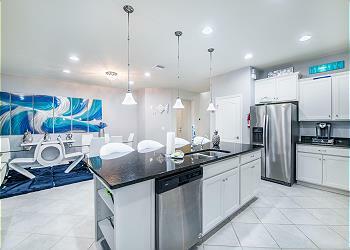 Laundry Room: • Extra large washer and dryer • Ironing board • Iron. Bedroom/Bed Sizes: • Master #1- King TempurPedic Downstairs • Master #2 - Queen TempurPedic Downstairs • Master #3 – King TempurPedic Upstairs • Bedroom #4 - King -Upstairs • Bedroom #5 - Queen TempurPedic Upstairs • Bedroom #6 - Queen TempurPedic Upstairs • Bedroom #7 - Twin/Twin w/ trundle - Upstairs • Bedroom #8 - Twin - Upstairs. 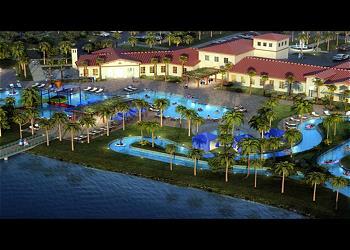 The Lanai includes a couch, dining table and 6 chairs, with a 4-burner Weber BBQ grill with propane for outside cooking. 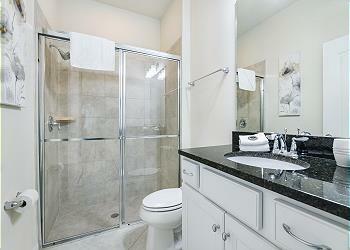 The entire home enjoys softened, filtered water for bathing and washing. There is a reverse osmosis, purified water faucet at the kitchen sink for unlimited, healthy drinking water and cooking use. A Keurig model 525 brewing machine is provided for instant hot beverages. Other kitchen appliances include: toaster, blender, microwave oven, food preparation tools and accessories.